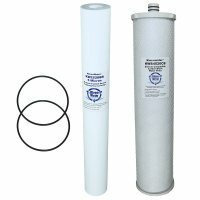 This high quality after market cartridge is a compatible replacement filter set to be used with Selecto Scientific systems MF 5/620 . Typically this system is used as pre-filtration for fountain beverage machines and other commercial food service industry applications providing clear and great tasting water free from chlorine and chemicals. The carbon block cartridge will remove chlorine for 40,000 gallons through the process of adsorption. The KWS4520CB also provides 5 micron sediment filtration furnishing crystal clear water. To provide perspective to the 5 micron sediment entrapment rating it is important to note the naked human eye can see down to 20 micron and a human hair is 100 microns in diameter. 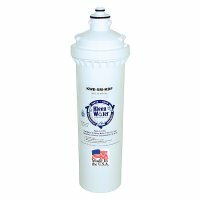 This sophisticated filtration will provide very high quality - great tasting water and will protect your beverage equipment from the potential adverse effects of unfiltered water.